On the first Saturday in May, back in 1970, 4,500 Anchorage residents raised $137,000 dollars for what was then called "Hope Cottage." And, back in 1976, Anchorage's Public Broadcasting station, KAKM channel 7, had a weekly TV magazine show called "Southcentral." Director, videographer and editor Michael R Dougherty (me), along with engineer Joe Gill, followed the 1976 Walk for Hope". KAKM engineer James Chafin provided the opening voice over introducing the completed video. It should be noted that for years after this walk, Hope Community Resources used the KAKM video to promote their yearly walk. 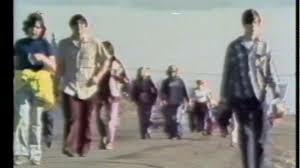 Now step back in time to 1976 and the Walk for Hope. By the way, the song used for the video is "A Fifth of Beethovan" a disco instrumental by The Big Apple Band that was released that same year. To keep up with the walkers and capture as much video of the walk as we could, Joe Gill and I drove along the walk route in the KAKM van, coming to a stop and setting up our camera when we found interesting settings. Editing the video took hours and hours, but the finished "music video" is fun to watch. Hope Community Resources is a non-profit organization first started in 1968 by Nancy Stuart Johnson and called Hope Cottage. This very active organization provides community support to Alaskan's and families who experience traumatic brain injury, mental health challenges, intellectual and developmental disabilities across the state of Alaska. Now called "Walk and Roll for Hope" this event continues today as an important fundraiser for the organization. Check out this fun video Break Up in Anchorage right now. I don't wish to one up you, but I also have a video of a film we made of the walk in the late 60's I think, for maybe the second or third walk. I donated a copy to the Walk for Hope folks a year or so ago, and they never knew it existed. The original 16mm film is in the vaults at AMIPA. I have it on video tape, and enjoy pulling it out and watching it every once in a while.